Find out about using public transport within New Zealand by clicking 'read more' on your chosen city. Auckland’s downtown area is compact and walkable, but its natural beauty lies outside the city centre. The ATHop card is Auckland's prepay transport card; it will save you money on transport if you're planning to be in the city for a few days. Buses connect all parts of the city and run frequently, especially on weekdays. Fares start from NZ$1 cash per segment (or NZ$0.50 with ATHop). Trains service some central, southern and western suburbs. Fares start at NZ$2.50 per stage (NZ$1.80 with ATHop). Ferries run between downtown Auckland, the North Shore and East Auckland, as well as Auckland’s islands. Fares cost from NZ$6.20 cash (NZ$4.50 with ATHop). Note that ATHop is not valid on all ferry services. From Auckland Airport, the SkyBus costs NZ$16 into the city. Airport shuttles are also available, costing from NZ$35. Download the AT Public Transport app to plan your journey, see fares and get real time updates on when your transport will arrive. Being a flat city, Christchurch is a popular place to cycle, with dedicated cycle lanes throughout the CBD. Buses link all central suburbs along with the outer areas of Rangiora, Waikuku Beach and Burnham. Fares start from $1.80 cash, or NZ$1.25 with a Metrocard. Blackcat Ferry services run between Lyttelton and Diamond Harbour, and cost NZ$12.40 return. From Christchurch Airport, Metrobuses offer regular trips into town for NZ$8 one way. Shuttles are also available. More of a historical activity than a form of transport, Christchurch Attractions allows you to tour the city on a restored tram. Tickets are NZ$25 per adult. Children under 15 ride for free. Wellington’s compact CBD makes it a great place to walk! But there are also plenty of public transport options. To pay your fare on Wellington's transport network, you can use cash or a range of prepay cards (depending on which bus company you'll be using). See how to pay your fare for more information. Wellington’s bus network is comprehensive, linking all suburbs with the Central Business District. Fares start from NZ$2.00 cash for a single zone. Trains connect downtown Wellington with the wider region, as far north as Masterton and Waikanae. Fares start from NZ$2.50 cash for a single zone. Ferry services leave from downtown Queens Wharf and travel to Seatoun, Matiu/Somes Island and Days Bay, costing NZ$11 one way. From Wellington Airport, the Airport Flyer bus travels to town and beyond, costing from NZ$9.00. Shuttles are available too. Wellington’s Cable Car takes passengers from downtown up to the Wellington Botanic Gardens. It’s one of Wellington’s most popular attractions, offering stunning views of the city and costing just NZ$9 one way. If you’re staying in Queenstown and are planning to do adventure activities or tours, your provider may offer a shuttle service. Check when you book. The Orbus bus service connects central Queenstown with the airport and Queenstown’s surrounding towns, including Arrowtown with a flat rate $2 fare across the network for passengers who buy a GoCard onboard. Cash fares are $5, or $10 to/from Queenstown Airport. Queenstown Water Taxis link the town with the Frankton arm of the lake, near the Hilton Hotel, and costs NZ$10 one way. For skiers, there are shuttles available for The Remarkables, Coronet Peak, and Cardrona. Treble Cone promotes a Car Pool system. Buses link downtown and its surrounding suburbs, with fares beginning at NZ$2.20 cash, or NZ$1.92 with a GoCard. From Dunedin Airport, regional buses like Intercity can provide transport if booked in advance. Airport shuttles are also available, costing from NZ$30. Many of Rotorua’s main attractions are outside the city centre. If you don’t have a vehicle, you may find it easiest to take a shuttle (like Geyser link or Thermal Shuttle) between attractions. Buses operate around the city centre and connect with the leisure park area of Ngongotaha. Fares start from NZ$2.60 (or $1.84 with a Smartride Card). From Rotorua Airport, Bay Bus Route 10 takes passengers into town for NZ$2.60. Airport shuttles are available, starting from NZ$21 to town. Totally Tarawera offer scheduled water taxis to Hot Water Beach on Lake Tarawera for NZ$25 per person. 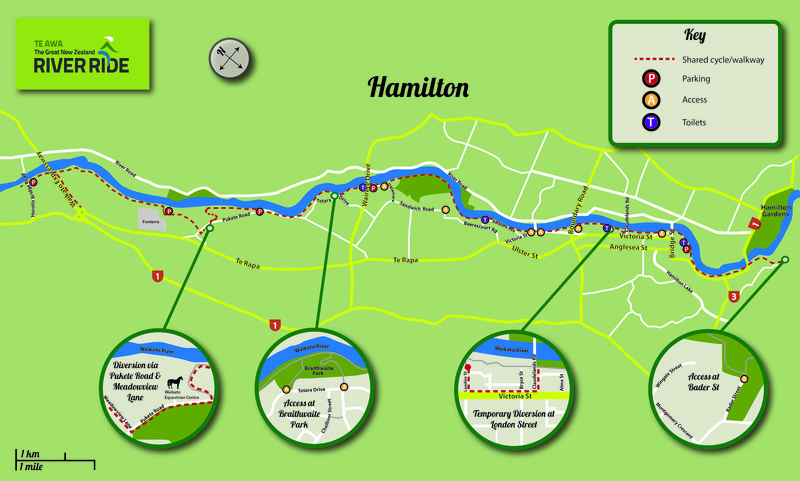 Hamilton's buses run the full breadth of the city from downtown to Te Awa shopping area and the Hamilton Gardens. Fares start from NZ$3.30 cash or NZ$2.40 with a BUSIT card. Airport shuttles are available from Hamilton Airport, and cost from NZ$33 to get downtown. Te Awa River Ride is a cycleway and walkway that runs the length of the city, following the Waikato River.